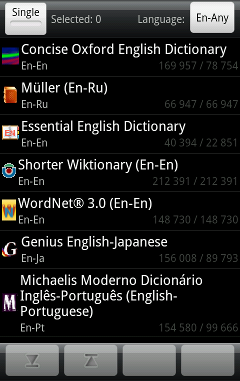 GoldenDict Mobile is a multi-format dictionary program with reach formatting, colors, images and sounds. It fully supports a lot of popular dictionary formats. 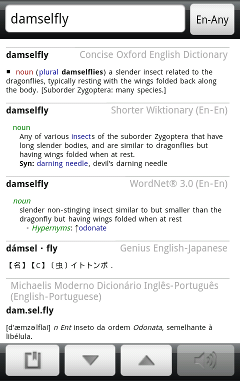 You can now carry all the dictionaries you want together with you on your Android device. All content is shown in full formatting, with images and sounds. We don't compromise on quality. It's fast. It flies when you have a dozen of dictionaries, and can handle hundreds of dictionaries simultaneously fairly well, too. The program will understand your typing no matter how you do it - forget about diacritics, case or punctuation! In-program popup mode is supported. Configure your e-book reader to use "ColorDict3" as your dictionary interface, and GoldenDict will pop up. Translating from clipboard is easy - just press and hold "Search" button on your device! Supported devices: all Android versions starting from 1.5 and up to 4.4. Try free version, then buy the full version if you liked it. There's also a completely free, open-source version of the program available for your desktop. Get it here. Copyright (c) 2008-2018 the GoldenDict project. All rights reserved.